How Dirty is Your Carpet? I’m going to start this off with full disclosure – I hate carpet. If I didn’t live in the frigid northeast, I wouldn’t have a single throw rug, area rug or mat anywhere in my house. No, not even in the bathroom. So you can imagine my dismay when we moved into our circa 1800 farmhouse with circa 1980 carpet. Fortunately, it was only in a few rooms. Unfortunately, one of those rooms was my bedroom. Ohhh, the vomit colored, marble patterned, smelly, wall to wall carpet….truly the thing of this germaphobe’s nightmares. I did have it cleaned before we moved in, despite the fervent claims of the previous owner’s realtor that they neither had pets nor smoked. It turns out when we moved the old dryer, there were about 100 burned out cigarette butts under it (my nose knows!). I know – who would smoke in their bedroom let alone stuff cigarette butts under the dryer? And yes, the washer and dryer were in the bedroom but that’s another story. And our neighbors told us they had all kinds of pets. Let’s just say I didn’t spend a lot of time on the floor. For years we’ve been buying up antique heart of pine flooring when we saw it listed on Craig’s List. To buy from a company who has retrieved and prepared for installation costs $20-$30 a foot. We were able to pick ours up for $1-$4 a foot. One person even just gave us about 100 SF for free! So we have a garage full of wood (no room for anything else) with the intention of someday replacing the floor in our bedroom and living room. Our living room floor isn’t bad – it’s 3/4″ wide, pre-finished strip oak. It looks okay – but compared to the 210 year old heart of pine, wide plank flooring in the rest of the house, it’s quite a disappointment. We’d always planned to redo the living room floor first since we spend most of our time there (and the floor isn’t insulated), but I finally talked my husband into redoing our bedroom first since it was just so gross. And, because our shed roof caved in, we needed a new place to store our gardening tools, bikes, and toys. The wood goes out, the shed stuff goes in – we still can’t park our cars in the garage. For Mother’s Day, I told my husband not to get me anything. All I wanted was the carpet removed from our bedroom. I have small kids so that wasn’t a completely reasonable (or honest) request. But my husband is a good man, so after I opened the plethera of bird-related items that my 5 year-old picked out at a local country store, he got right to work taking out the carpet. After about 20 minutes, he came out and said, “okay, get it all cleaned up!” It was Mother’s Day, but I didn’t care! I was so happy to get rid of that germ nursery, I happily grabbed my broom and ran right upstairs. When I stepped down into our room (I have to step down because the addition’s floors/ceilings are almost a foot offset from the original house), I wanted to cry. Dirt was everywhere! Not just a little dust here and there but sickening piles of dirt. Did I mention I’m a germaphobe? 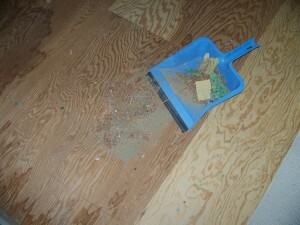 The picture on the left is only a small sample of what I swept up off the floor. Thirty years of smoking, pets, skin follicles, dust…ugh. I estimate I swept up about 2 pounds of it by the time I was finished. I’ve read several articles that discuss the contaminants found in carpet. A lot of them come from wearing shoes in the house – chemicals, pesticides, dirt, pollutants, feces – and some come from things in your house like cleaning chemicals, dust and microscopic bugs. There, I said it – there are bugs in your carpet. Not to mention if you buy commercially available carpet or rugs, you’re bringing chemicals into your home right from the store. I know I do – I would love to have 100% wool organic carpets but my budget only allows for the hard stuff. I’ve been slowly switching over to all natural cleaning products but I have to admit, I’m having a hard time letting go of Clorox spray. It’s just so satisfying to see the grout stains turn white all by themselves. We are a strictly no-shoes household – except for those rare occasions when someone gets past my Socks Only sign (or ignores it). I get it, some people feel like they lose their superpowers if they remove their shoes. Even though we don’t wear our shoes in the house, our floors are still dirty. Pollen, dust, food, play dough and more regularly hang out on my floor, sticking to my feet when I walk through the house. I hate to vacuum and mop so as much as I don’t want to admit it, it probably stays there longer than should be allowed. What about you? Are you shoes off or shoes on? Has any of this changed your mind? Have a good renovation or home improvement story to share? Post it below or LIKE my Facebook page and let me know about it. If you LIKE my page in the month of June (and you’re local), you’ll be eligible for a gift card to Aubuchon Hardware in Glenville. Hi Dawn. I totally agree with you how nasty carpets can be. We built our house almost 5 years ago and have wall-to-wall carpeting in our living room and bedrooms. We also do not wear our shoes in the house or allow eating (other than the occasional bowl of popcorn with a movie) in the living room. About 4 or 5 months after we moved in I agreed to have a kirby salesperson come do a demonstration. I let them know that I was not interested in having my floors vacuumed since the carpets were brand new and my vacuum cleaner was new as well, which I vacuumed with regularly (including right before they came), but I would allow them to do a demonstration on our furniture, since they were not new. Well, the kirby girl came and demonstrated a brand new kirby vacuum cleaner, first on our rug, even though I didn’t really want her to, and then on my furniture. To my disgust, my carpet was nasty dirty. I couldn’t believe the amount of dirt/dust/nasiness she was able to get out of my brand new rug after I had just vacuumed with my brand new vacuum. If a brand new carpet is that gross, I can’t believe how nasty the old ones are. If I had known, we probably would have gone with more hard wood than carpeting. Can’t wait to see pics of your new bedroom! Oh, I’m never having the Kirby girl come to my house then! It’s so dusty from our woodstove and all the pollen out here in the country! I have a Hoover The Boss vacuum and I hate it – loud, noisy, awkward to use – so I don’t vacuum unless I have to! Some day I will retire to warm climate and only have tile and rugs I can throw in the wash! Thanks for your comment!